Here’s how it’s done: A North Carolina judge – and veteran – who sentenced a three-tour, PTSD-afflicted veteran to 24 hours in jail for a DUI offense, and noted how the offender trembled at sentencing, served the time with him. Judge Lou Olivera, 45, a Gulf War veteran who presides over an innovative Cumberland County veterans’ court, had sentenced Joseph Serna to a 24-hour jail stint after Serna admitted he’d lied about his urinalysis test. 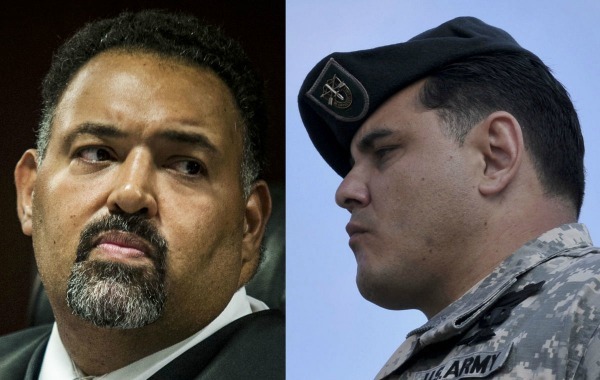 A married father of seven and Special Forces Green Beret sergeant who served three tours in Afghanistan, Serna has appeared multiple times in Olivera’s court as he struggles with sobriety. Email subscribers may click the title of this article to link to the video. This article first appeared in CommonDreams. Wow, so amazing. I love the part of the judge going into the hole to help him climb out. Very moving. This entry was posted on April 26, 2016 by Vox Populi in Opinion Leaders, Social Justice, War and Peace and tagged Judge Lou Olivera, PTSD, The judge and the veteran, Veterans Court.